1. Who is the Angel of YHVH? 2. Did ancient Judaism believe in a Divine and pre-existent Messiah? 3. Is YHVH three persons? 4. How do we fix the problem and what problems can we see stemming from the misunderstandings of our forefathers? I have often heard that we already have the answers, we just need to ask the right questions, and I personally believe this proverb passed down by our forefathers. The first question is who was and is the Angel of YHVH? To answer this question, we will delve into the scriptures and some very old commentaries and what we will find is there was a time, and it is now upon us again where many people understood and are starting to understand who the Angel of YHVH was and is. So, who is this mysterious Angel that has no name? We must understand at least a little of the languages of the time to understand what the Apostles believed about the messiah, but we must first start with the scriptures to ask the correct question that many of our forefathers asked. Jdg 13:16 And the angel of Yahweh said unto Manoah, Though thou detain me, I will not eat of thy bread: and if thou wilt offer a burnt offering, thou must offer it unto Yahweh. For Manoah knew not that he was an angel of Yahweh. 17 And Manoah said unto the angel of Yahweh, What is thy name, that when thy sayings come to pass we may do thee honour? 18 And the angel of Yahweh said unto him, Why askest thou thus after my name, seeing it is secret? The Strong’s has another word as a definition. From H6381; remarkable: – secret, wonderful. What I found when I researched this word is it can mean many things and is used in only two places in the scriptures. The other place we see this word used is in the Psalms. Psa 139:4 For there is not a word in my tongue, but, lo, O Yahweh, thou knowest it altogether. Psa 139:5 Thou hast beset me behind and before, and laid thine hand upon me. We have a mystery here, so we must treat it as such. What I found is the root of this word is indeed used in other places in the Bible, but one stands out to me the most because the translators decided to use the same word in different translations. This word is only one letter away from the word we studied in Judges. The same root and a very similar definition has been used. Let us go back to Judges to see what different translators used in the place of “secret”. (Brenton) And the angel of the Lord said to him, Why dost thou thus ask after my name; whereas it is wonderful? (ASV) And the angel of Jehovah said unto him, Wherefore askest thou after my name, seeing it is wonderful? So, we see that one translator used the word hidden, while a handful of others used the same word used in Isaiah 9:6, the word wonderful. The name of the Angel of YHVH is Wonderful, yet we see that in Isaiah 9:6, the same Hebrew root, with a very similar definition is used for the name of one most agree is the Messiah. This is what the Talmud, a “Living Commentary”, meaning it is added to and it never ends and makes many changes has to say about Isaiah 9:6. Targums are Aramaic translations with commentary on the verses. So, we see that our Jewish Bretheren in many cases understood Isaiah 9:6 to be about the Messiah, something modern Christianity indeed teaches and got right in my opinion. 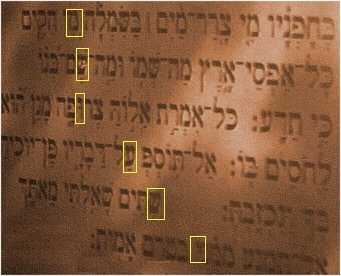 In many translations, it says the Angel of YHVH’s name is hidden or secret. This tells us we need to look closer at the connections we have made here. If it was not yet revealed and is indeed hidden, we ought to be able to find it hidden somewhere in the Tanak also dubbed “Old Testament”. There is a mystery in Judaism that can help us on our guide to answering who the Angel of YHVH is. Isaiah 9:6 -For a child will be born to us, a son will be given to us; and the government will rest on his shoulders; and his name will be called Wonderful Counselor, Mighty God, Eternal Father, Prince of Peace. There will be no end to the increase of his government or of peace, on the throne of David and over his kingdom, to establish it and to uphold it with it with justice and righteousness from then on and forever more. The closed mem appears within the word לםרבה (l’marbeh), which is translated by the phrase “to the increase.” The reader can see that the second letter of this word (reading from right to left) is a closed mem. The first letter, ל (L), is a prefix translated “to the.” The main part of the word םרבה (marbeh= “increase”), is spelled with a closed mem. This word, marbeh, is found several other places in the Hebrew Bible, always in the form the reader expects it to be, with an open mem at the beginning. The only place where marbeh appears with the closed mem is in Isaiah’s passage about the birth of this very special Child, a Son who is given Divine titles and who will rule as Messiah Ben David. The mystery of the closed mem helps us figure out who this Angel of YHVH is, but first, let us discuss some other things that help us figure this out. His name is secret, wonderful, and hidden according to the translators. Most Hebrew scholars will take the approach of which word is the correct word, but I will take the approach that all translations in this case are correct, his name is wonderful, hidden, and secret. The issue is, where is it concealed? We must first look at some other things before we see how this is true. As stated before, the Targums are Aramaic translations with some commentary on the scriptures being discussed. Let us see what the Targums have to say, which pre-date the coming of Yeshua. In the Targums, it is not written “The Angel of YHVH”. In the Targums, it is written that it was the Memra or Word of YHVH that opened the wombs of the matriarchs, wrestled with Jacob in the desert, and went before the Israelites as a pillar of cloud and smoke when they left Egypt. The Prophet announced to the house of David: ‘A boychild has been born unto us, a son has been given unto us, who has taken the Torah upon himself to guard it; and his name has been called by the One who gives wonderful counsel, the Mighty Elohim, He who lives forever; ‘Messiah’, in whose day peace shall abound for us. And the MEMRA (Word) of YHVH caused to descend upon the peoples of Sodom and Gomorrah,brimstone and fire from YHVH in heaven. 1. AFTER THESE THINGS THE MEMRA(Word) OF THE LORD CAME UNTO ABRAM IN A VISION, etc. (XV, 1). It is written, As for Elohim, His,-way is perfect; the MEMRA of the Lord is tried (II Sam. XXII, 31) if His way is perfect, how much the more He Himself! Rab said: The precepts were given only in order that man might be refined’ by them. For what does the Holy One, blessed be He, care whether a man kills an animal by the throat or by the nape of its neck;? Hence its purpose is to refine *try+ man.2 Another interpretation: ’His way is perfect’ alludes to Abraham,3 for it is written, And thou foundest his [sc. Abraham’s] way faithful before Thee, etc. (Neh. IX, 8). ’ The MEMRA of the Lord is tried’ intimates that the Holy One, blessed be He, tried him in a fiery furnace. He is a shield unto all them that take refuge in Him (II Sam. loc. cit. ); hence, FEAR NOT. ABRAM, I AM THY SHIELD, etc. The Targums were considered authoritative during ancient times, and the Rabbis that changed Judaism into what it is today obviously ignored the Targums. Now, let us read John 1 with the idea that the Angel of YHVH is also the Memra(Word) of YHVH. This time, we are going to use the same ideals as the ancient Rabbis who understood the idea of a pre-existant Messiah and figure out who this Angel of YHVH is, was, and always will be. Joh 1:1 In the beginning was the Word(MEMRA), and the Word was with Elohim(God), and the Word was Elohim. 2 He was in the beginning with Elohim. John 1 makes a little more sense now doesn’t it. The Rabbis of old, not most modern Rabbis would have understood this verse clearly. It was not until the Middle Ages that Rabbinical Judaism changed the thinking of what the Messianic expectation is. Rashi pretty much changed the landscape of Jewish thought when it comes to the Messiah. Now, back to the closed mem. We can see in Isaiah that a closed womb would give birth to the Messiah, but the Angel/Memra/Word of YHVH said his name was wonderful, secret, and hidden. In the case of looking for a correct translation, I discovered that all translations are correct. The name of the Messiah is Wonderful. The name of the Messiah was indeed secret to the Patriarchs, and it was indeed hidden throughout the Tanak(Old Testament) and we will prove this here today. Wonderful- Isa 9:6 For unto us a child is born, unto us a son is given: and the government shall be upon his shoulder: and his name shall be called Wonderful, Counsellor, The mighty El, The everlasting Father, The Prince of Peace. Deu 29:29 The secret things belong unto Yahweh our Elohim: but those things which are revealed belong unto us and to our children for ever, that we may do all the words of this law. As stated earlier, we already have all the answers, we just need to ask the right question. Pro 30:4 Who has gone up to the heavens and come down? Who has gathered the wind in His fists? Who has bound the waters in a garment? Who established all the ends of the earth? What is His Name, And what is His Son’s Name, If you know it? The ironic thing is the answer is concealed on many levels right in the question. Let us start by going question by question and answering with Brit Chadasha scriptures on a literal level, then we will move on to where his name is hidden right there in these very scriptures. Act 1:1 In the first book, O Theophilus, I have dealt with all that Jesus began to do and teach, 2 until the day when he was taken up, after he had given commands through the Holy Spirit to the apostles whom he had chosen. 3 He presented himself alive to them after his suffering by many proofs, appearing to them during forty days and speaking about the kingdom of God. 2. Who has gathered the wind in His fists? 3. Who has bound the waters in a garment? 4. Who established all the ends of the earth? Joh 1:1 In the beginning was the Word, and the Word was with Elohim, and the Word was Elohim. 2 The same was in the beginning with Elohim. 3 All things were made by him; and without him was not any thing made that was made. Col 1:7 As ye also learned of Epaphras our dear fellowservant, who is for you a faithful minister of Christ; 8 Who also declared unto us your love in the Spirit. 9 For this cause we also, since the day we heard it, do not cease to pray for you, and to desire that ye might be filled with the knowledge of his will in all wisdom and spiritual understanding; 10 That ye might walk worthy of the Lord unto all pleasing, being fruitful in every good work, and increasing in the knowledge of God; 11 Strengthened with all might, according to his glorious power, unto all patience and longsuffering with joyfulness; 12 Giving thanks unto the Father, which hath made us meet to be partakers of the inheritance of the saints in light: 13 Who hath delivered us from the power of darkness, and hath translated us into the kingdom of his dear Son: 14 In whom we have redemption through his blood, even the forgiveness of sins: :15 Who is the image of the invisible God, the firstborn of every creature: :16 For by him were all things created, that are in heaven, and that are in earth, visible and invisible, whether they be thrones, or dominions, or principalities, or powers: all things were created by him, and for him: :17 And he is before all things, and by him all things consist. 18 And he is the head of the body, the church: who is the beginning, the firstborn from the dead; that in all things he might have the preeminence. 19 For it pleased the Father that in him should all fulness dwell; 20 And, having made peace through the blood of his cross, by him to reconcile all things unto himself; by him, I say, whether they be things in earth, or things in heaven. 5. What is His Name, And what is His Son’s Name, If you know it? This is where it gets a little tricky. Remember, the name of the Messiah is both secret and hidden in the Tanak(Old Testament) so we MUST find it there. The ironic thing is for thousands of years it has indeed been hidden and secret within the very scriptures that ask us His Son’s name. What is His son’s name? Starting with the first yod, counting every 22nd letter spells – you guessed it – Yeshua shai, which means “Yeshua, the Gift.” Yeshua means Jesus in Hebrew. And for a second witness we also can find his name hidden in Isaiah 53, coincidence? So, with all evidence looked at we can definitely come to the conclusion that the Angel of YHVH is indeed the pre-existant Messiah, Yeshua(Jesus) before he took the form in the flesh, the Creator, and the living image of the invisible Elohim(God). Now let us move on to the next question, did ancient Judaism believe in a Divine and pre-existent Messiah? You may be shocked, but even the Sages of old knew the Messiah existed before all things. It is written in the Zohar(Very deep commentary on the book of Genesis), that an Angel(Matatron) was the same Angel that walked through the pieces while Abraham was asleep. Metatron is a name given by Sages to describe the Angel of which they did not know his name. Meta means divine and trone means throne, so his name means the divine one of the throne. The angel according to Jewish theology, was he who discoursed with Moses and the angel in whom G-d placed His Name. The following from the Zohar is of interest in this case: There is a man, if a Man He is, Who is an Angel. This Angel is Metatron, the Keeper of Israel; He is a man in the image of the Holy One, blessed be He, Who is an Emanation from Him [from G-d]; yea, He [the Metatron] is YHVH. Of Him cannot be said, He is created, formed or made; but He is the Emanation from G-d.
We see here that the same things the Brit Chadasha(New Testament) says is the same as what at least some of the sages in ancient Israel believed. Some steer from Jewish commentary because it has quite a bit of error, but in this case, it looks like they nailed it. The Zohar is indeed a book that should be closely tested, as it carries much mystical interpretations, but in this case, it matches what scripture says about the Angel of YHVH being in existence long before Yeshua(Jesus) walked the earth in the flesh. Many Rabbis of old agree. So we now know who this Angel of YHVH was,is, and always will be, we know ancient Rabbis saw the Angel of the Covenant that walked through the pieces as the Messiah. We know that the Rabbis obviously believed in a Messiah who could take the form of a Man, but that he was not created and he is and was YHVH, but what about the other questions? Don’t worry, we will get back to the closed mem. Is YHVH three persons as Christianity in its mainstream form teaches? In my search to find the answer to this question, I have come to a conclusion that YHVH is one, but not one as Judaism teaches, but not three separate personas as Christianity teaches. It takes a bit of study of the Hebrew idea of exactly what “one” is before we can go further, so why not start in one of Judaism’s most quoted yet most misunderstood(even by Hebrew speaking Jews unfortunately) called the Shema. The Shema is a prayer based solely on scripture that all Hebrews, Messianic, Orthodox, Chabad, and all in between knows and recites every day, that is if they are good Hebrews(laughing a bit). Deu 6:4 Hear, O Israel: The LORD our God is one LORD: 5 And thou shalt love the LORD thy God with all thine heart, and with all thy soul, and with all thy might. 6 And these words, which I command thee this day, shall be in thine heart: 7 And thou shalt teach them diligently unto thy children, and shalt talk of them when thou sittest in thine house, and when thou walkest by the way, and when thou liest down, and when thou risest up. 8 And thou shalt bind them for a sign upon thine hand, and they shall be as frontlets between thine eyes. 9 And thou shalt write them upon the posts of thy house, and on thy gates. To the reader who only speaks and understands English, this verse contradicts a Tri-une nature of YHVH, but to the one who understands what the two main Hebrew words “elohim” and “echad” in this verse, we find both modern Judaism and modern Christianity are slightly, even sometimes way off. The Hebrew word “elohim”(God) is PLURAL and the word “echad”(one) has also a plurality to it. Let us look and see how these words cause a HUGE disagreement between modern Judaism and modern Christianity. I know, I know, how can a plural word also carry a singular meaning?????? When we see what the word “echad” means, we can understand this better. A numeral from H258; properly united, that is, one; or (as an ordinal) first: – a, alike, alone, altogether, and, any (-thing), apiece, a certain [dai-] ly, each (one), + eleven, every, few, first, + highway, a man, once, one, only, other, some, together. Echad can be used to describe plural beings that are united as one, such as a team or a family unit. We find this use in the very creation of man. We see multiple beings united as one to create man in THEIR image. Let us see what I mean. Gen 1:26 And Elohim said, “Let Us make man in Our image, according to Our likeness, and let them rule over the fish of the sea, and over the birds of the heavens, and over the livestock, and over all the earth and over all the creeping creatures that creep on the earth.” 27 And Elohim created the man in His image, in the image of Elohim He created HIM – male and female He created THEM. We see here that Elohim(God) created man in HIS image and in THEIR image. The word “echad” is a unit when combined with the PLURAL Elohim. It says THEY created man in THEIR image and then turns around and says HE created man in HIS image. This breaks all English rules, it also breaks the modern Hebrew rules if we look at it in a Linguistic view, but, if we look at it as both the Father and the Son who is not a created being and as the CREATOR it makes perfect sense. The Father and Son are “echad” or one, a unit, not divided into three parts but they are one. The Holy Spirit is also one with both the Father and the Son, they are unified or “echad” with one another, but the Father as with any household is the only Authority and the Son must do as the Father says. The issue is not that modern Judaism is wrong or modern Christianity is wrong, the issue is both are correct, yet the argument continues. We are created in the image of YHVH, three parts, but unified as one body, consisting of flesh, Soul, and Spirit. We do not separate the three parts we are made of, and we do not cancel out two parts because one cannot live without the other. Now, the biggie is can man come in the flesh, but still be comprised everything that YHVH is made of? According to the Apostle Shaul(Paul) and many ancient Sages(learned ones) it did indeed happen, twice. WHAT? Twice??????? YES TWICE! When Adam was created, he was perfect, he was made in the image of YHVH in his fullness, but then he sinned, and that separated man from YHVH until the redeemer would come. Now back to the closed mem. The open mem, according to the Sages, represent the closed womb, and the open mem represents the open womb. The Redeemer would have to be born from a closed womb, or, a virgin, as a sign that he was indeed the redeemer, this is one thing that modern Judaism rejects, but Ancient Judaism accepted as we will show. There had to be a new Adam in order to redeem man from sin. This is exactly what Yeshua(Jesus) is according to Shaul(Paul). 1Co 15:45 And so it is written, The first man Adam was made a living soul; the last Adam was made a quickening spirit. 46 Howbeit that was not first which is spiritual, but that which is natural; and afterward that which is spiritual. 47 The first man is of the earth, earthy: the second man is the Lord from heaven. Now, we see what Rav Shaul(Paul) says, but what about ancient Judaism??????? ?Ancient Judaism is responsible for scribing the Greek Septuigent around the third century B.C. There is a HUGE debate between modern Judaism and Christianity about the proper word and translation used in Isaiah 7:14. The word used for virgin in the Hebrew scriptures is “alma” and can mean virgin, but can also simply mean “young maiden”. If we use only the Hebrew scriptures, the argument would go on and on for ever, but since we have the Greek Septuigent that ONLY JEWS scribed long before the man named Yeshua was born, we can know without a shadow of a doubt that the intended meaning is indeed “virgin”, and not simply “young maiden”. In Isaiah 7:14, the Greek word used is “parthenos” and can only mean virgin. Adam was formed from the dust of the Earth, Yeshua was formed in the womb of a virgin and carried all the sinful nature of man through Eve the mother and all that makes up YHVH. Just as Eve was taken from Adam’s bosom, Yeshua(Jesus) was taken from the bosom(chest) of the Father. When he died, his sinful nature inherited through Eve died and when he was raised, he was raised in the full glory of His Father, no longer burdened by his sinful nature inherited through Eve. At the resurrection we too who are found worthy will be raised without the evil inclination we inherited from our parents and will be able to live sinless lives. That is something to look forward to, good news we can all hope for, those who believe. Now on to the last question, how do we fix the issue of the disagreements we have inherited from our forefathers? We must start testing everything, stop hating our neighbor, and start communicating between Jews and Christians. I have seen much Anti-Semitism coming from Christianity and much hatred coming from Jews of all types towards Christians. What must start taking place is dialogue. We must be willing to sacrifice our PRIDE, and that is all it is is PRIDE. To the Jew I ask, are you going against Torah to talk to and even teach a thing or three to Christians? To the Christians I ask, are you Holier than a people who have died many times throughout history at the tip of a “Christian” sword, are you too good to talk to the Jew? You will have differences, you will see scripture in a different light from one another, but the question remains, is conversing against Torah and was it not the will of the Father to have His Son executed to the Christian by His own people? Can we blame Christianity for the Trinity? Did not Judaism teach the same principles in the past? Can we blame the Jews for killing Yeshua? Isa 53:6 All we like sheep have gone astray; we have turned every one to his own way; and Yahweh hath laid on him the iniquity of us all. 7 He was oppressed, and he was afflicted, yet he opened not his mouth: he is brought as a lamb to the slaughter, and as a sheep before her shearers is dumb, so he openeth not his mouth. 8 He was taken from prison and from judgment: and who shall declare his generation? for he was cut off out of the land of the living: for the transgression of my people was he stricken. 9 And he made his grave with the wicked, and with the rich in his death; because he had done no violence, neither was any deceit in his mouth. 10 Yet it pleased Yahweh to bruise him; he hath put him to grief: when thou shalt make his soul an offering for sin, he shall see his seed, he shall prolong his days, and the pleasure of Yahweh shall prosper in his hand. 11 He shall see of the travail of his soul, and shall be satisfied: by his knowledge shall my righteous servant justify many; for he shall bear their iniquities. This is dedicated to all the Family I have offended, and all the friends lost while finding my Faith, may YHVH bless you all in everything you do and may he open all of our eyes to HIS WAYS and not our own, HaShem Yeshua, Amein Amein!